What grabs the reader fairly early on in Junk DNA is just how wonderfully complex and sophisticated the biological machinery in our cells is. As a non-biologist, I found that reading her description of the way that the cellular mechanisms pull the two copies of a chromosome to opposite sides of the cell, for instance, absolutely riveting. But it's not all superbly functioning miniature marvels: Nessa Carey also explores the many ways that these genetic mechanisms can go wrong. Anyone who ascribes the complexity of biological systems to a designer needs to contemplate just what a messy, over-complex and ad-hoc design has emerged. I really hadn't though of there being a mechanism for separating copies of chromosomes before - and I think this is the beauty of Carey's book. Us non-biologists have some vague idea of how cells split or proteins are assembled from the genetic 'instructions', but there's a whole host of mechanisms required to go from an apparently simple concept to making it happen, and this really opens up in Junk DNA. I mentioned how things go wrong. As genetic medical conditions are often a key to unlocking the secret of a cellular mechanism, there is a lot about genetic failures here, some very distressing - I'm personally not a great enthusiast for things medical (I can't even watch Casualty, let alone 24 Hours in A&E), but in this context it at least wasn't gratuitous. Of course, as the name suggests, at the heart of the book are all the bits of our DNA - the vast majority of the content of our chromosomes - that aren't genes. 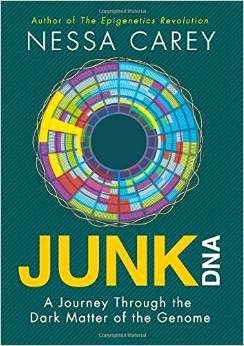 In her previous book, The Epigenetics Revolution, Carey had already introduced us to some of the workings of what was once referred to as 'junk DNA' - specifically how parts of it turn various genes on and off, effectively acting as the controls that work the mechanisms specified by our genetic blueprints - but in this new book we see many more processes, capabilities, wonders and failings of the super-genetic parts of the system. I do have a couple of niggles. This is a topic that lends itself to metaphor and simile - I did it without even noticing in the previous paragraph, but Carey plunges into metaphorical mode at the slightest opportunity, and some of her similes are a little painful - when she brings in the movie Trading Places or a Bugatti Veyron, for instance, the process seems forced. (Even the subtitle is a metaphor of sorts.) Also slightly irritatingly, several times she refers to the human appendix as having no function - if she'd read my Universe Inside You, she'd have known that this concept, like classifying all DNA that doesn't code for proteins as junk, went out some time ago (the appendix does have a useful function as a kind of respite centre for friendly bacteria from the wild conditions in the stomach). Where C is followed by G in our genome, the C can have a small modification added to it. This is most likely to happen in regions where this CG motif is present in high concentrations. The large number of CCG repeats in the Fragile X expansion provide exactly this environment. This is by no means the most concentrated example of labellitis, and typical of quite a lot of the text. In the end I was happy to think 'It goes with the territory, live with it.' There is still so much fascinating material in here that it is well worth ploughing through the biological wordfest.